Recent email inquiries from readers have reminded me that the internet is a great tool for gathering information, but sometimes you have to sift through an awful lot of garbage to get to it. On the surface, it would seem that social awareness of the Ainu is at an all time high, and a Google Search will get you an amazing number of hits. Many of these references do not stand up to close scrutiny. A great number of them are brief and often misinformed references on sites that use the Ainu to "prove" some point they are trying to make. Tattoo promotion sites, for example. Then there are computer game-related sites that incorporate the Ainu (in fictionalized form) among the races and cultures represented in a game, but undiscerning readers can, and have, mistaken information picked up from these sites as historically accurate. In the midst of this confusion, however, I find the occasional insightful blog post that clarifies, rather than muddies, the issues. 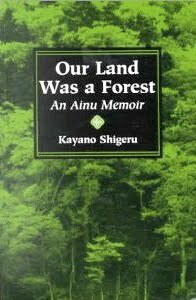 Recently I came across this well-written book review by Chris Kearin, about Our Land Was a Forest, an Ainu Memoir by the late Ainu activist Kayano Shigeru. This short and easy-to-read memoir is recommended for anyone who wants a basic, first-hand account of Ainu culture and their recent history. 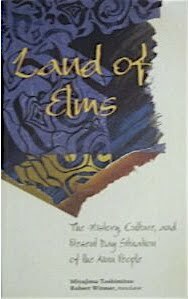 For an account that is less personal-- thus less emotionally charged-- Land of the Elms: the history, culture, and present day situation of the Ainu by Toshimitsu Miyajima makes good background reading. For detailed information and photos on diverse subjects including hunting methods, religion, architecture, etc, I don't know of any better resource in English than Ainu, Spirit of a Northern People. I recommend it highly for serious research. This and other recommended books are posted on the sidebar at the right of this blog. 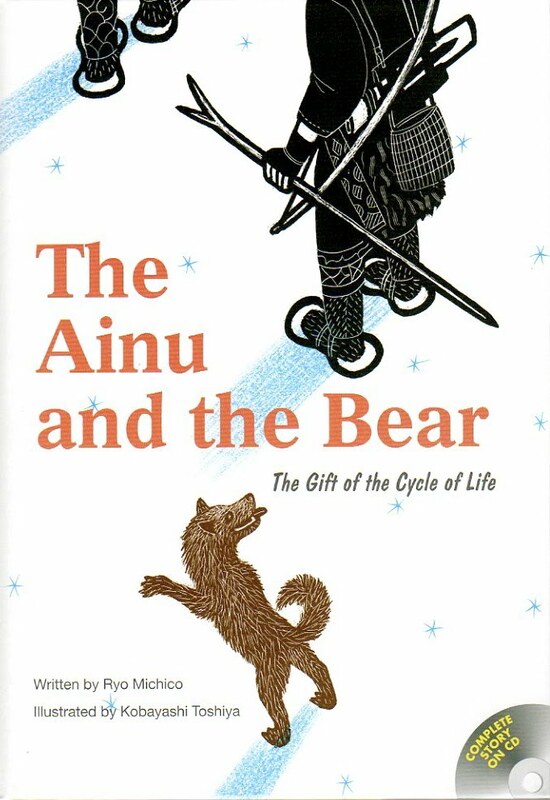 Italy-based writer and book-blogger Mari Juniper recently posted a review of The Ainu and the Bear~the Gift of the Cycle of Life on her website. She calls the book "a valuable lesson for all of us, children and adults equally, as it teaches us to respect the food we ingest. Being carnivorous, omnivorous or vegetarian, everything we ingest, industrially processed or not, contains the vital energy of another living being." Mari adds that she "found particularly compelling the description of the boy's feelings throughout the bear's life, especially when he witnesses her demise. It is soothing to see how he learns to deal with these feelings while interacting with nature in a positive and respectful manner." But she does include a warning that the book might not be suitable for all young readers: "I gave the book to a ten-year-old English girl to read, fearing that she wouldn't finish it. I was surprised to know that she liked it, although she felt sorry for the bear when it was ritualistically sent home. I believe the book's lesson is so true that it resonates with a deeper part of us, which is why the girl accepted the difficult elements of the story so well [...] I would recommend this book to every parent who wants to raise a highly aware human being. However, I wouldn't recommend it to an unprepared child. My reader is not a common ten-year-old girl, being very mature for her age. I'd suggest that the parents read the book first, take some time to digest it and then read it with their kids. " You can read Mari's review in its entirety at Mari's Randomities. The question of the extent to which we can truly accept the values of another culture is one of the most pressing and the most difficult in today’s age of multiculturalism. The Ainu Iomante, or bear-sending ceremony, which is often described as cruel and barbaric, is one such topic of contention. Even though we might consider ourselves liberal-minded and accepting of cultural differences, it is difficult to remain open-minded when we are confronted with an activity that, on a personal level, we find objectionable. Of course, the easiest option is not to think about whatever we find offensive, and this was the easy road taken by the Japanese government in prohibiting the Iomante for fifty years. It takes much more courage, however, to confront our prejudices and fears. This is the difficult road recently taken by many indigenous cultures. Silenced for many years by virtue of their minority status and negative feelings of cultural self-worth, indigenous peoples have recently become confident to tell their stories. Their willingness to engage with the mainstream, which requires a reciprocal effort of understanding from the general public, engenders recognition and respect for the subaltern. Repositioning the context of the Iomante does not take away the debate over the animal cruelty involved, but it does create a space in which dialogue is possible. As a scholar of indigenous minorities, as a teacher and as a wanna-be open-minded person, it is my hope that this book stimulates conversation, opinion and debate rather than the laissez-faire apathy towards Ainu that, to my mind, is the surest sign of disrespect. Melissa Kennedy is an Assistant Professor at the Nagoya University of Commerce and Business, Faculty of Foreign Languages and Asian Studies, and co-edits the NUCB Journal of Literature. Her special fields of research include: Indigenous and minority cultures, Asia-Pacific cultural globalization, Maori literature, and Ainu cultural rejuvenation. She is currently working on a book of interviews with well-known Ainu artists, activists, politicians and educators who are both proud of their cultural heritage and committed to keeping it alive and thriving. This video clip from the British Museum provides a very brief commentary on the Iomante "bear sending" tradition of the Ainu. It is necessarily over-simplified, and the pronunciation of Ainu words is a bit off, but I think it's worth watching. I plan to post more commentaries and references to this subject from time to time. If you find something that may aid in understanding the issues in our discussion of the Iomante (or Iyomante) ritual, please leave a comment. what does iomante mean for modern-day ainu? 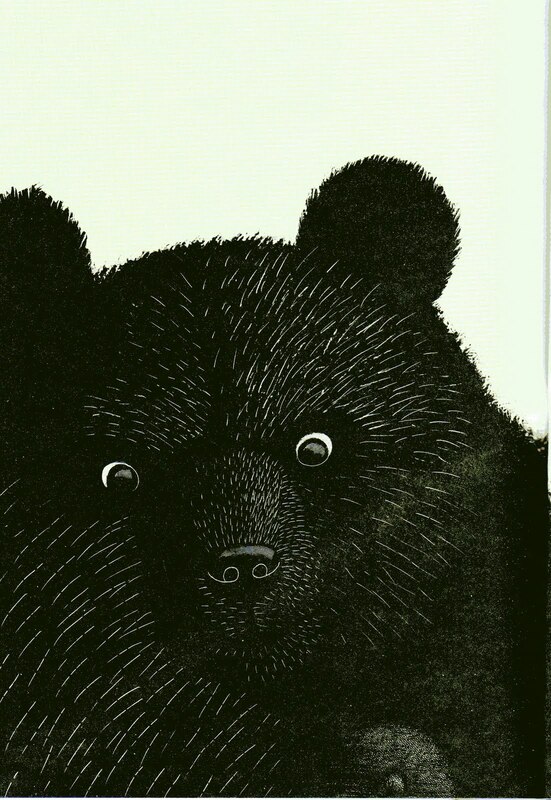 Iomante (or Iyomante), the controversial "Bear-Sending Ceremony," which is so sensitively depicted in our most recent storybook translation (The Ainu and the Bear~the gift of the cycle of life; RIC Publications; 2010), is bound to upset some readers. We realize this, and sympathize. A newborn bear cub is torn from its mother (at the cost of the mother's life) and raised with tender care by a village, only to be killed in a ceremony that releases its spirit from the human world so it may return to the spirit world from which it came. The book does not advocate the practice. It simply explains how the custom fits into the traditional Ainu worldview, and attempts to show that within that worldview, the practice makes some sense, and is not meant to be a cruel one. In 1955, Iomante was outlawed in Japan as barbaric, but the prohibition was rescinded in 2007. Does this mean the practice will be revived among the Ainu? Not likely. The ceremony has already been documented in detail on film for the historical records. 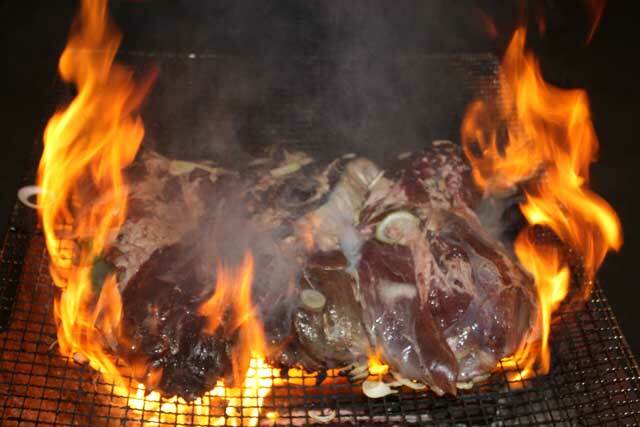 The need for bear meat and bear skins in daily life is a thing of the past. Furthermore, the bear population of Hokkaido is declining at an alarming rate with the spread of urban areas. So what does the right to practice Iomante mean to today's Ainu? I have been looking for hints of the answer to this question for some time now, and was intrigued by a recent news article about a sending ceremony conducted for the shimafukurou (Blakiston's fish owl). 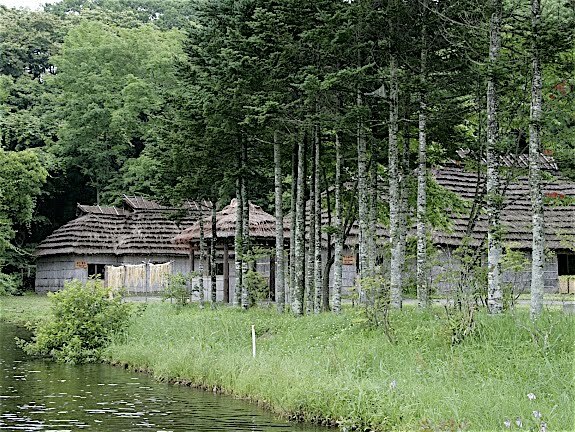 The shimafukurou is traditionally regarded by the Ainu as the guardian of the village. In some areas of Hokkaido it is the highest-ranked Ainu god, while in other areas the bear ranks higher. The sending ceremony for the owl is similar to that for the bear. According to the news article, the dead body of a fledgling shimafukurou was found on a rural highway in the Hidaka area of Hokkaido on December 25, 2009. From the ID bracelet attached to its leg, it was identified as a juvenile that had been released into the wild just six months earlier by the Ministry of the Environment. The MOE is involved in breeding this endangered bird to circumvent its extinction. Even fledgling shimafukurou have wing spans that can exceed one meter (three feet), while the fully mature owls can be more than two-meters (six feet) from wingtip to wingtip. The man who discovered the dead owl, the president of a construction company and member of the Hidaka branch of the Hokkaido Ainu Association, was reported as saying, "I knew at once it was no ordinary bird. There were the half-eaten remains of a duckling nearby. The owl must have brought its meal to the road to eat, and then gotten hit by a car." 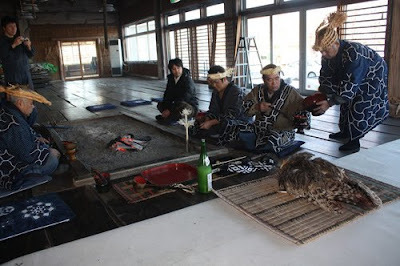 That same day, before returning the bird to the MOE, the Hidaka branch of the Ainu Association conducted a "sending ceremony" (Hopunire) to send the bird's spirit safely back to the spirit world. The subtle differences in meaning between Hopunire and Iomante seems to depend on the geographic origin of the speaker, but for the purposes of this blog post, the difference is insignificant. I have also read that Iomante has been conducted in recent years for bears that die in captivity, such as those reared at the Kuma-bokujou bear park in Noboribetsu, one of the areas in Hokkaido where people of Ainu descent are concentrated. In these, and perhaps other ways, it appears that the tradition of Iomante is being preserved and carried on by modern-day Ainu. See original news article about the sending ceremony for the dead owl (Japanese).